Can't make one of our regular classes? Whatever your age or interest in Karate we very much welcome hearing from you and hopefully seeing you at one of our classes! The 'Find a Club' page can be accessed from the left hand side menu of the website or by clicking here - Find a Club. You may want to learn Karate to strengthen your body, strengthen your mind, seek a method of self defence, or you may just want to try something different. At S.E.M.K.A. everybody is welcome, men and women, who are complete beginners, those who have not trained for a while and those that are new to the area and have come from another club or style of Karate. At your first lesson you will meet the Instructor who will take down registration details and any health conditions. He/she will explain what will happen on your first training night and answer any questions that you may have. After the warm ups you will be put with an appropriate Instructor for the evening. The many benefits of Karate include improving fitness, concentration, confidence, self esteem and focus. Fitness can be defined by the "S" factors, which can be found in Wado-Ryu Karate (a Martial Arts system). These are Speed, Strength, Stamina, Skill, (P)sychology. The development of speed is one of the major elements. This is done by moving a limb at speed as in a kick, punch block, lock, throw or takedown, or changing from one stance or position to another. This can be defined as 'the tension or force that a muscle or group of muscles can exert against resistance'. With strength comes power, and the ability to perform any technique quickly and with a variable degree of force. To be able to perform some of the kicks and other movements, flexibility exercises have to be performed before techniques can be practised. Aerobic work is facilitated by the function of the heart, lungs and circulating blood functioning at the exact level of the work rate. By practicing the same movement again and again the stamina can be increased. This can come through a repetition of movements(s) and by the development of easy and fluid movements. The emphasis is on the correct patterns of movement. Concentration, visualisation, meditation, mental rehearsal, and focus can be used to increase inner energy, which will help to build confidence, correct attitude and the awareness of one’s state of mind if you were attacked. Within the S.E.M.K.A. syllabus you learn traditional Wado-Ryu as taught by the late founder Master Hironori Ohtsuka. This consists of Basics, blocking and countering techniques, which would enable one to cope with all types of situations. 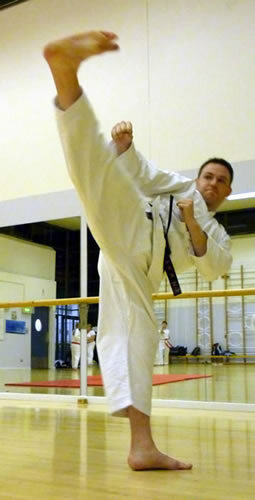 A series of movements called Kata (form) is performed against imaginary attackers and can be practised on one's own. Once the Katas have been learnt they can be used to keep aerobically fit. 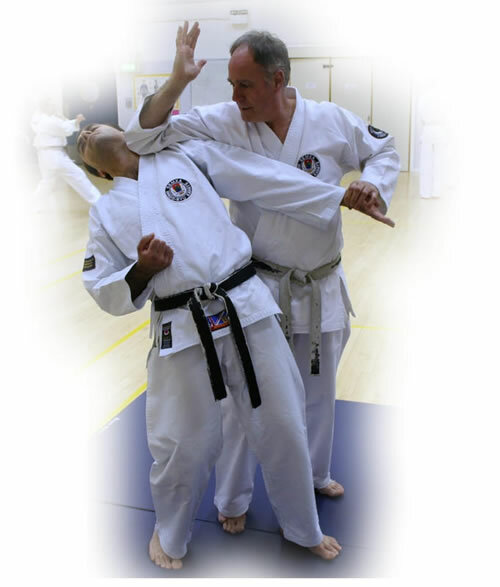 Within the syllabus is a self defence system, which teaches the student how to use their skills against attacks, which are used on the street. Karate is a form of self defence but the real essence of Wado Ryu is to train hard yet search for a mental condition where martial arts need not be used. Within the syllabus adults are taught awareness of different situations and personal safety practices.